The European wind industry has grown so rapidly over the past decade that it is facing a critical shortage of skilled personnel, a new report reveals. There is currently a shortage of 7,000 qualified personnel required by the European wind energy sector each year, a figure that could increase to 15,000 by 2030 if the number of graduates taking courses relevant to the industry does not rise. 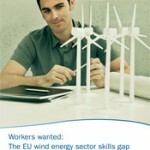 The figures come from a new report by the European Wind Energy Technology Platform (TPWind), based on research by renewable energy consultancy GL Garrad Hassan: “Workers wanted: The EU wind energy sector skills gap”. A full 78% of companies that responded to the TPWind questionnaire said they “found it difficult or very difficult to find suitably trained staff”. This in an EU with an overall 11% unemployment rate, and a youth unemployment rate of 20.9% (5.5 million people between the ages of 15-24). Filippo Gagliardi, Project Manager for EWEA, which coordinates and hosts the TPWind Secretariat, says that there are different reasons for the gap between skills and jobs in the industry. These include the rapid pace of growth in the sector – installed capacity has increased from around 13 GW in 2000 to more than 100 GW in 2012, far beyond all forecasts; a demographic problem whereby retiring engineers are not being replaced, due to lack of new engineers; and a dearth of students with STEM skills – science, technology, engineering and mathematics. The lack of new people with STEM skills is an issue now, and will be even more so in the future, as the proportion of operations and maintenance jobs will grow in the wind industry. To circumvent this, the report recommends introducing industry experience into training and education, thus expanding the cohort of graduate level wind energy generalists. ‘Access to the experience of the wind industry can be provided through short-term secondments or visiting lecturer roles for senior industry professionals. This would benefit current students and help to shape future curricula. Industry and universities could jointly fund internships or create industrial scholarships’ says the report. In addition, a framework is needed to coordinate this cooperation between industry and academia, there needs to be harmonisation between vocational education and training at EU level, and an increase in emphasis on O&M training. Other recommendations are to improve core and STEM skills within industry itself, through targeted courses run by external providers. By taking these steps and ensuring that the European wind energy industry has access to a well trained workforce, wind energy will be able to continue to play a pivotal role in the transition to a renewable energy system. It will also help to boost economic growth and create hundreds of thousands of jobs.